Took this photo for a blog post for Craftsy but it's out of focus so I won't use it after all. 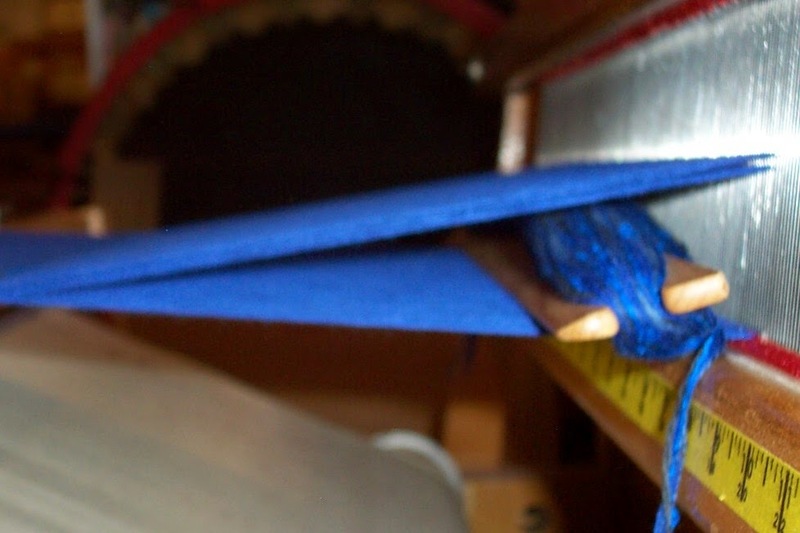 I'm planning on a post about winding weft packages and when using a stick shuttle, I always wind the weft only over one edge of the shuttle in a figure 8. I often see people recommending winding over both edges and around the middle which effectively makes a very fat weft package. I'm told it's to cram as much weft onto the shuttle as possible. Unfortunately that isn't really the best way to do it, in my opinion. So, some free advice - and remember what free advice is worth! 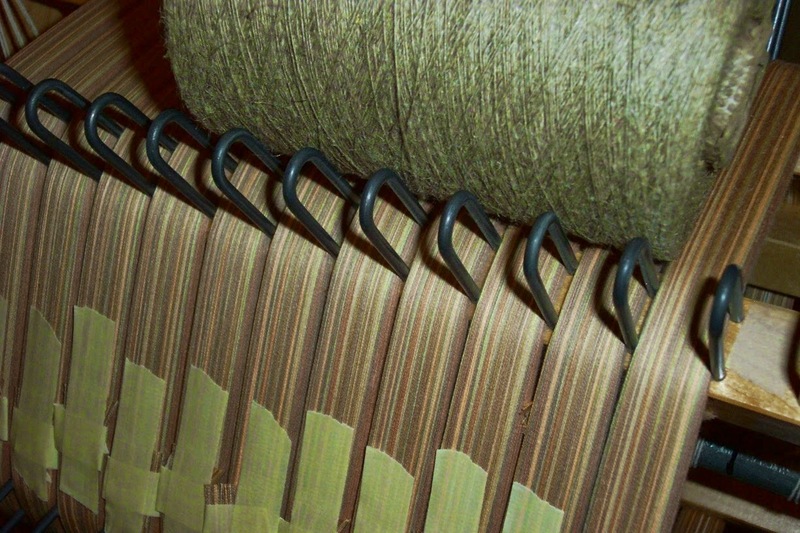 By winding the weft in a figure 8 over one edge of the shuttle, the yarn builds up at the back of the shuttle and most of it lies on the top. My stick shuttles are Leclerc brand, and I think you can clearly see that they are beveled on the leading edge. 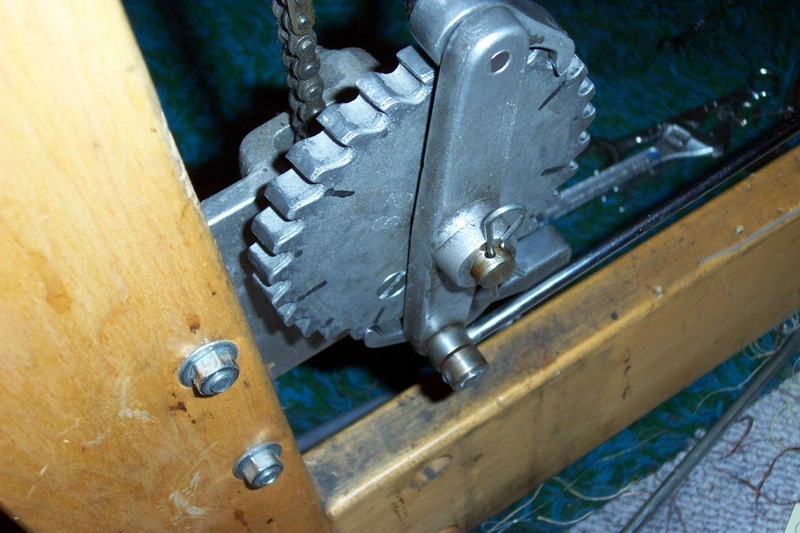 By winding the weft on the other side, the 'spine' of the shuttle, in a figure 8, the shuttle can be used as a beater when weaving on a loom without one. 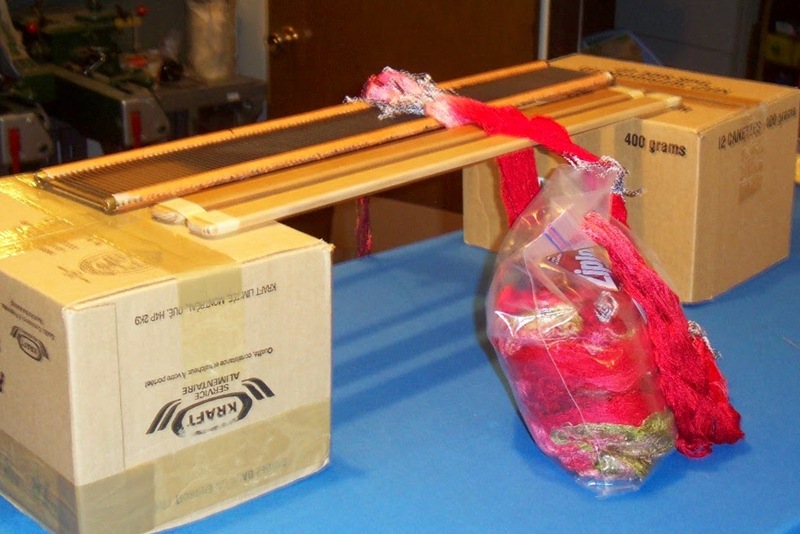 By putting the majority of the yarn on the top of the shuttle, the bottom is mostly wood, which will glide much more easily than yarn rubbing against yarn. The weft package takes on a wedge shape which closely matches the shape of the shed. All in all it just makes more sense to me to work with the tools and yarn. A stick shuttle wound with a great big fat weft package will not go through the shed easily, will abrade the yarn, both on the shuttle and the warp and in the end is a form of 'hurrying' which really isn't very efficient. Every yarn has a beginning and an end. Learn how to deal with joins and ultimately, again in my opinion, make weaving a lot more enjoyable by winding smaller more efficient weft packages. 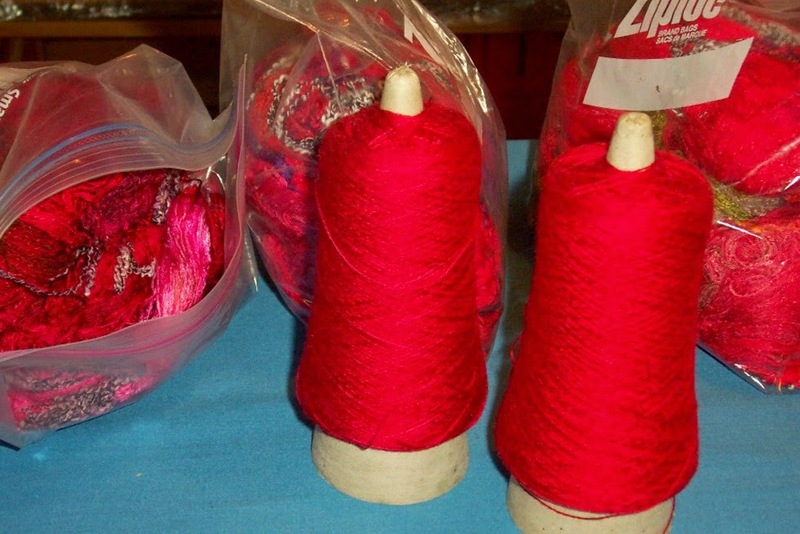 And that includes bobbins, quills and pirns. This isn't the best photo - taken on my cell phone. 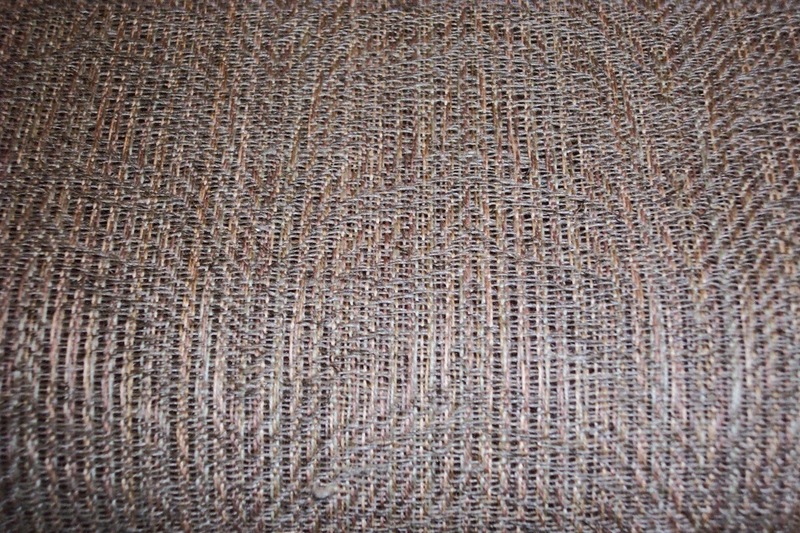 Would you believe this was woven by a complete and absolute beginner? Perfectly straight selvedges and a beat that was pretty darned consistent! 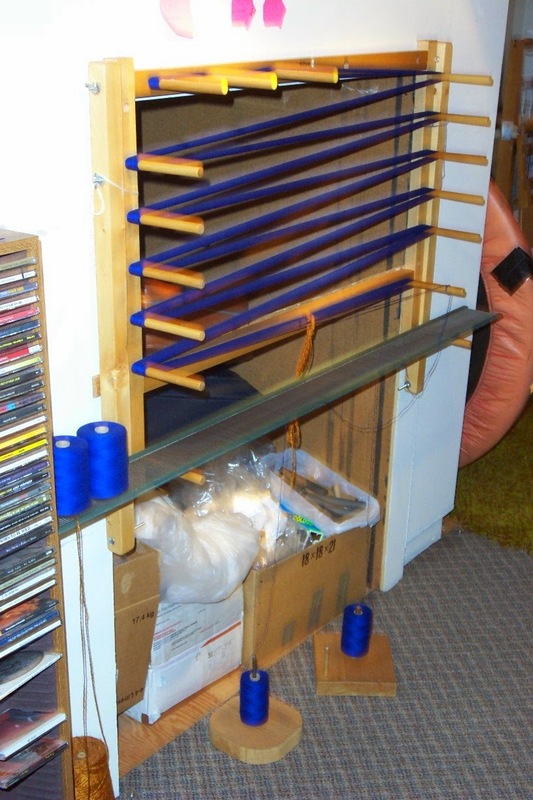 The guild has a couple of looms with warps on so when I got a phone call the other day from someone saying she wanted to learn how to weave but didn't have a loom, was there any possibility of learning? I invited her to the guild drop in. Tonight she braved the cold temps (it turned into a serious cold 'snap'), I spent about 20 minutes giving her an introduction to the loom (this is warp, this is weft), quickly went through the names of the different parts of the loom, explained about threading, tie up, treadling, then covered basic posture at the loom, how to hold and throw the shuttle and wham, bam, she was off as though she'd been weaving for years. 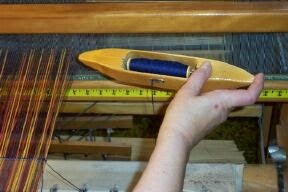 She's going to try to come back on Saturday when I have another wannabe weaver coming. They each can take a loom and see how it goes. But I think the one tonight is...hooked. There is more than one way to skin a cat (sorry cat lovers). It seems everyone thinks their way is the absolutely best way to do what they do. But we are not all equal. Nor do we all want to make the same things. 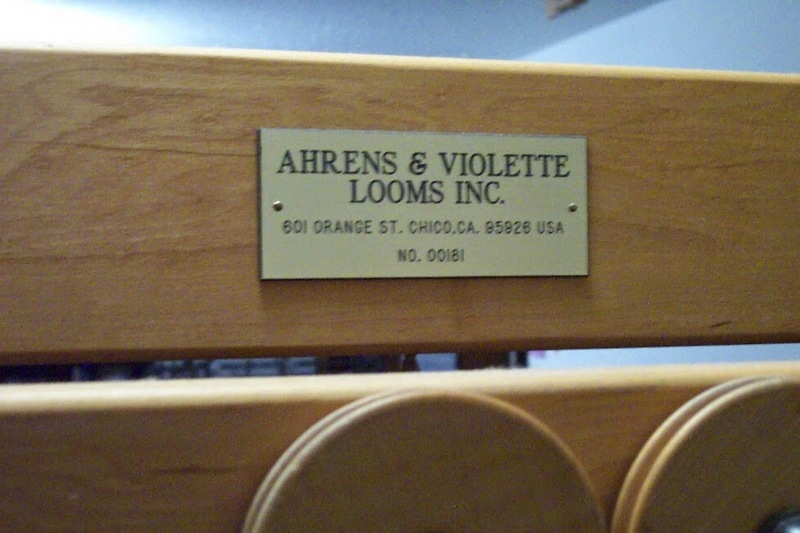 Our looms are different, the yarns we are using are different. So while I believe that my method is the best method for me, I know that it may not be the best method for anyone else. Over the years I have fine tuned my processes in order to streamline the amount of effort required in what is a very labour intensive craft. Once I figured out the best equipment to purchase for my needs, worked out how to do the processes with the least amount of surplus effort, set up my studio so that things are at hand, got looms that best make the type of cloth I want to weave, the rest was practice, practice, practice. Over and over again I see new weavers assuming that they will get stellar results the very first time they make it to the loom. 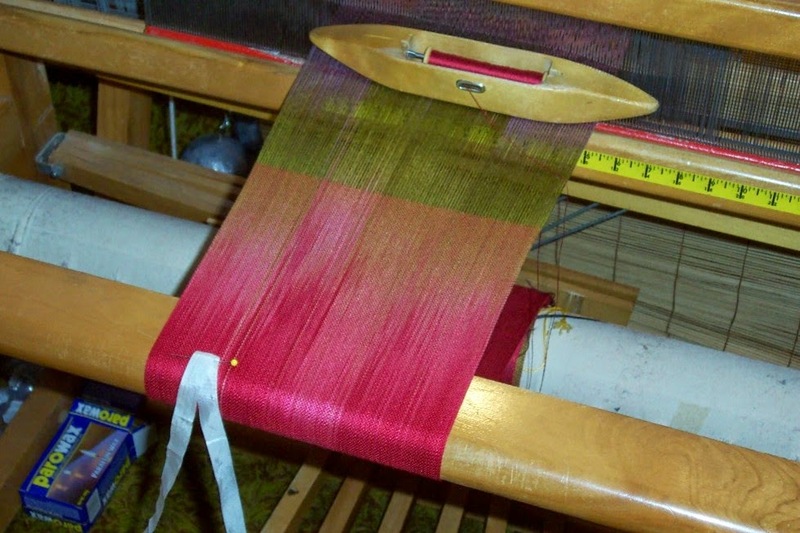 Unfortunately weaving requires certain basic skills and they don't come without effort. True there are some people who are better more quickly than others. What I said about us not being equal? Manual dexterity and eye/hand co-ordination are abilities that some people have in abundance, and others? Not so much. So yes, while some people do get really good results very quickly, it is not a given. In addition to the actual physical skills required, obtaining appropriate equipment (warping pegs, warping board, mill, drum, wheel, sectional? 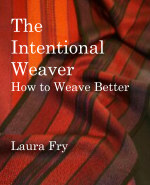 ), weavers must also learn about the materials they are using. Being able to make good choices is sometimes intuitive, other times poor choices are made and results are not as desired. 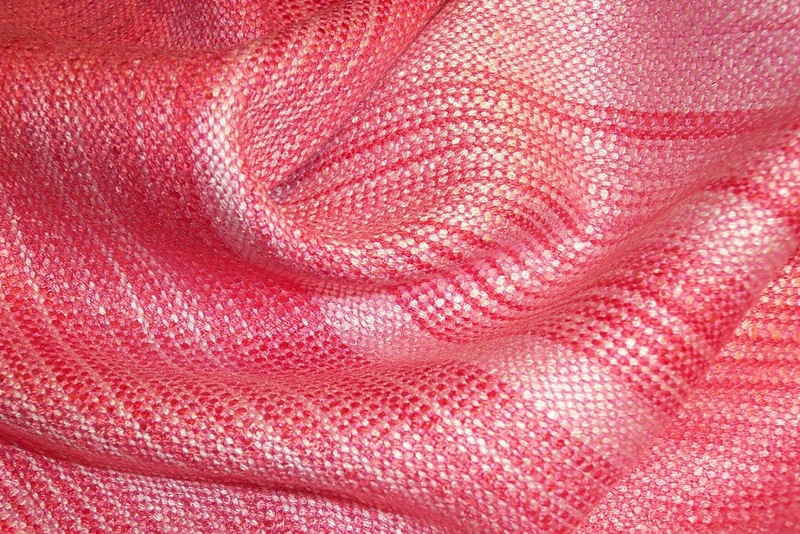 Then there is the way colour blends in a woven structure, how texture affects the cloth, the appropriate density for the function the cloth is to serve. 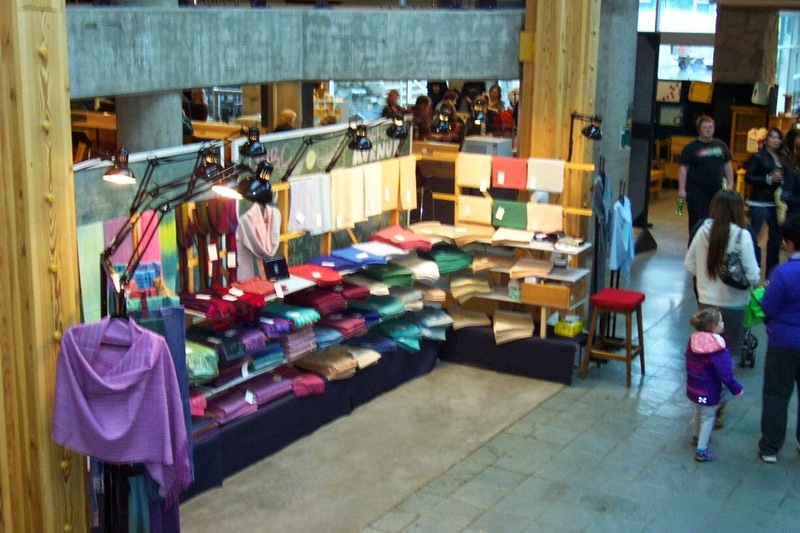 There are many many facets or layers involved in learning how to create textiles. It is what keeps me coming back to the loom, because there is always something more to learn. I find that extremely satisfying. 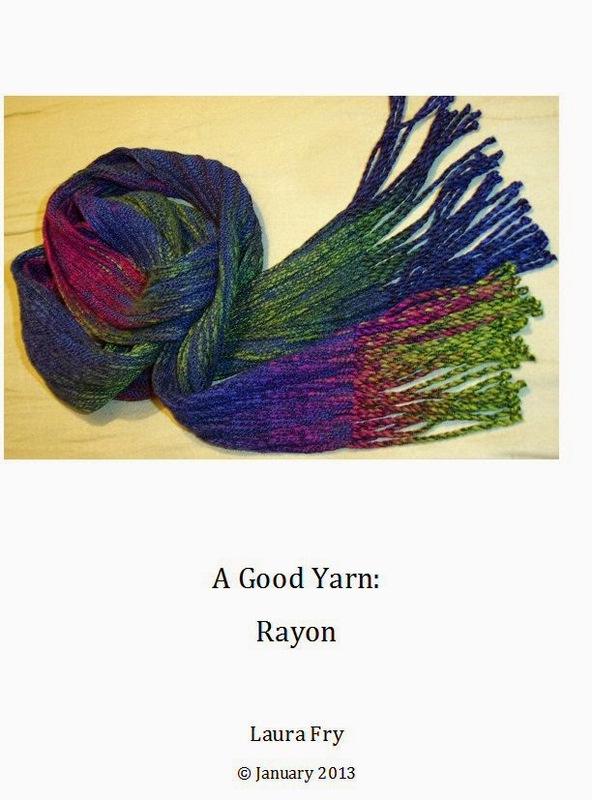 I have been very low on rayon chenille scarves for the past couple of years and this year after all was said and done, there were just three scarves left. I could have sold a lot more if I'd had more, and since I still have significant inventory of rayon chenille, I'm revisiting them. Actually a friend came and wound this warp for me last summer but with my back issues they never got woven. So it was a slam/dunk to take the already wound warp and get it onto the loom yesterday after I cut the last painted scarf warp off. I even got it threaded before dinner so it took just a few minutes this morning to sley, tie on and begin weaving. My challenge now is to use up as much of my rayon chenille stash without buying more to go with it as I can. Of course that means stretching my creativity to the limit as I'm very low on the colours I like and have plenty that don't sing to me. But sometimes that's when you really begin to stretch and grow as an artist/artisan. It is only by pushing our boundaries that we do grow. My friend wound two warps for me so I'm really hoping I can get both done and deliver the four scarves to the fringe twisting elf tomorrow night. Since rayon chenille needs a pretty substantial beat, I don't know when I'll be able to whomp away at weaving so I'm trying to get these and some place mats done now. The beginning of the end...this is the last of the painted warps for scarves and it is now officially 'done'. Weaving, that is. Thinking a lot about Life and whatnot. In the 1960's the Rolling Stones famously sang You Can't Get No Satisfaction. For a while I believed that. If anyone had told me that whether or not I was happy was based on the choices I would make, I would likely have sneered. Happiness wasn't a choice - either Life was Good and you were, or Life was Awful and you weren't. Well several decades have passed since then and I now realize that whether or not one is happy is, in very large measure, down to choice. Come March of next year it will be 40 years since I made the fateful decision to give up everything I had been doing and become a weaver. I don't know why I knew that was a good choice but what I discovered was that - while I'm 'poor' financially - I was to become rich beyond my expectations in terms of satisfaction. Indeed, in that most rare of coins - happiness. Weaving came to me at the persistent efforts of the universe, who obviously knew better than I did what I needed. 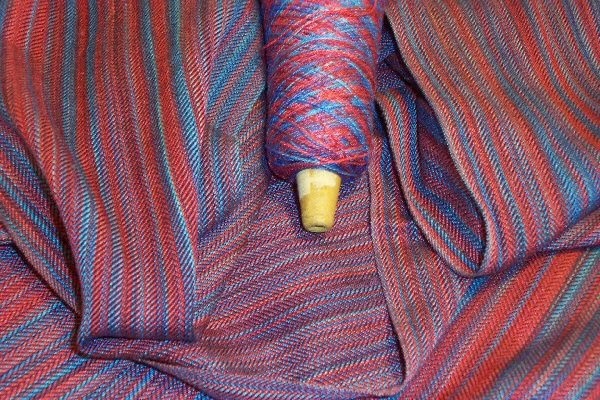 What I discovered was that weaving wasn't just about taking threads and making cloth. Or, not just. Weaving satisfies the creative thinker, the planner, the control freak, the mechanic, the athlete/dancer, the teacher/mentor, the author. I even discovered the joy of certain parts of mathematics, much to my never ending surprise! 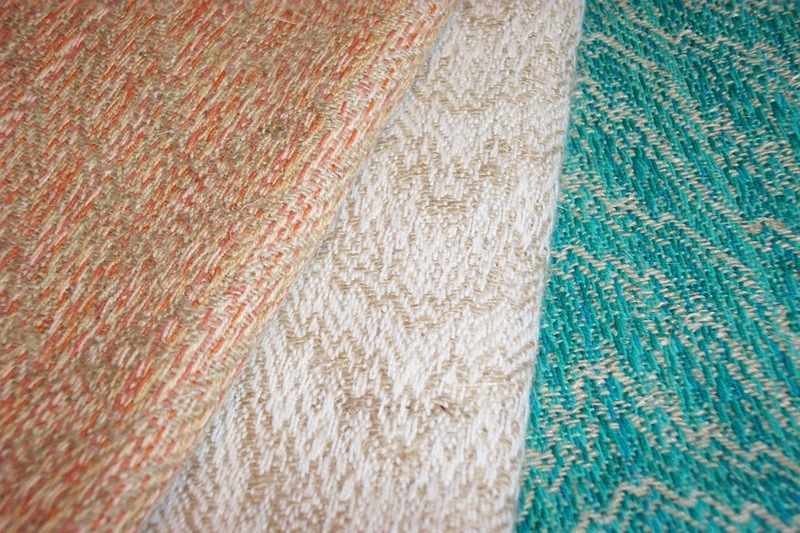 Weaving satisfies the tactile, the visual, the imagination, the physical. I discovered that my path in life up to that fateful moment had laid the foundation for me to leap into weaving with gusto. I had even taken classes in high school that proved invaluable - Law 11, Office Practices, Typing. With writing came a computer - eventually - and my typing skills stood me in good stead. Bookkeeping? I could set up my own ledger and double entry bookkeeping system so that I could track my own financial records. I could make up class handouts. Eventually even self-publish a book. Several 'books'. Being self-employed allowed me to set my own hours (way too many, usually! ), take time off when I wanted to, accept commissions or refuse them based on my desire to do that - or not - or the state of my health. At my age, many people have much bigger pension funds and way more material goods. But I've had experiences that they have not, met people I would never have met in an 'ordinary' job. If I were to be told that this is the end of life, I would be sad - mostly because I have so much yarn, so many more ideas I would like to bring into being. But ultimately I have lived my life in such a way as to say that I have had a great deal of satisfaction. Yes, there have been pot holes. Yes, I have some regrets. But it has been a full and active life. And I am satisfied. So there, Mick Jagger! When the loom is working and only surface attention is required my mind can wander and think about other things. The thing is, I have to be creating something. Making is as much a part of me as, well, breathing. Oh, I know, I exaggerate, but I am not a happy camper when I can't weave. The amount of satisfaction, even joy, I receive from taking individual threads and making cloth? Priceless. The joy I see on the faces of people who buy my cloth? Even better. So, yes, even though I am adding to the material 'burden' of society - quite literally - I decided today that I was no longer going to feel guilty about it. If joy is the ultimate result of the time I spend at the loom - not just mine, but others - surely that is justification enough? I rarely accept special orders any more - unless it is just doing one of my established designs in a different colourway. But I agreed to tackle this special order for a couple of reasons. One, the customer gave me complete freedom to design something. Two, I had so many requests for table textiles that I figured even if the customer didn't like what I did I could probably find a customer somewhere. When I do accept a special order I tell the customer that I will make something, no obligation on them to actually buy it. The cloth is to be a square that will fit on a round table. Doing just one item isn't economical in terms of investment in time, so I put 10 yards on today (yes, I 'worked' on Christmas Day - my work is my play, too) and should be able to get 5 or 6 squares out of the warp. I have ideas for several different designs. At least one will be woven with dark green as weft, but I also have some fine natural linen in a sort of brown-ish hue, plus I have some two ply cotton/linen blend. So that's three possibilities. I'm sure I can find more yarn in my copious stash. Each square will be woven with a different tie-up/treadling and when completed I will invite the customer to take a look at all of them and see if she likes any of them. 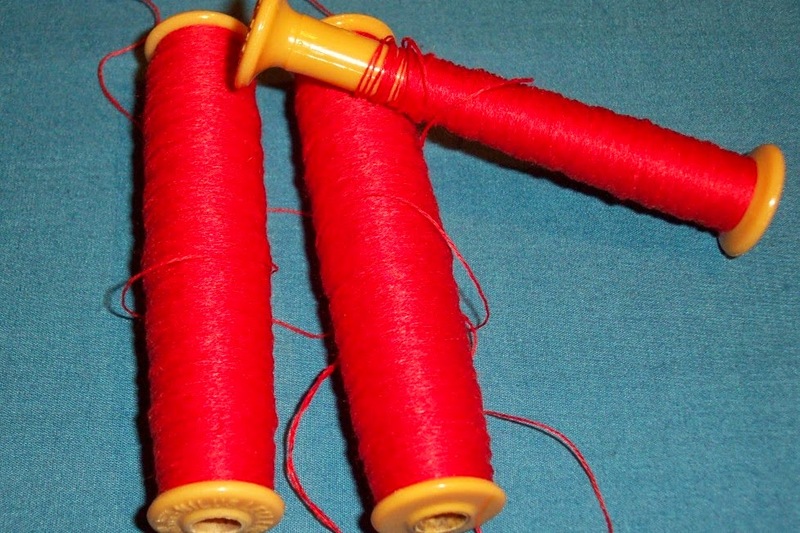 As a side benefit, I realized that some of the red 2/8 cotton was actually 2/16. This pleases me because I had been thinking of ordering in some 2/16 in reds and now I don't have to. Win! Currently reading The Willful Princess and the Piebald Prince by Robin Hobb - a title I stumbled on at the library but which isn't listed on her website - not sure why. This is it - the last of the painted warps. It's been a very long time, much longer than I had hoped, but then when Life Happens, all you can do is weather the storm as best you can and if your plans go awry? Well, that is how Life Happens. Weavers are, by their nature, a bit of a control freak. We tend to love the tiny minutiae that is involved in the process. 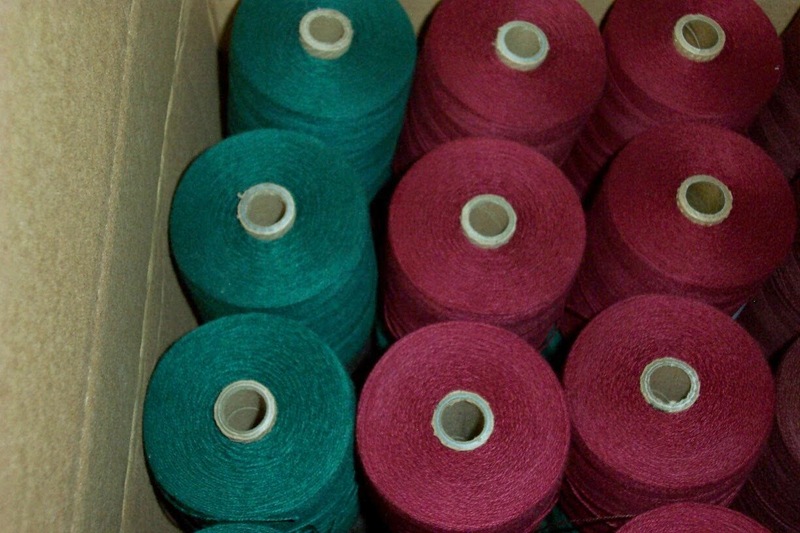 We talk about a thread under tension being a thread under control. We nit pick the slightest inconsistency. We fuss when things don't turn out the way we want, even though the results are perfectly acceptable. Weaving keeps us humble as time after time things go zooming out of our control and we fight to bring them back to where we want them to be. So at last, at very long last, I am getting the 'last' of the painted warps into the loom. It will be done before the official new year will take place (she says, trying to exert control). I have a long list of stuff to make for the craft fairs next year and a much too large stash that I am hoping will yield the majority of the yarn with which to make it. I'm really hoping to see my stash reduce, not grow. So far that hasn't worked too well as I have bought yarns to use as warp in order to use Lynn's Legacy. And I have used up quite a lot of that fine linen. But there is more! But now I need to turn my attention to other things, other yarns. 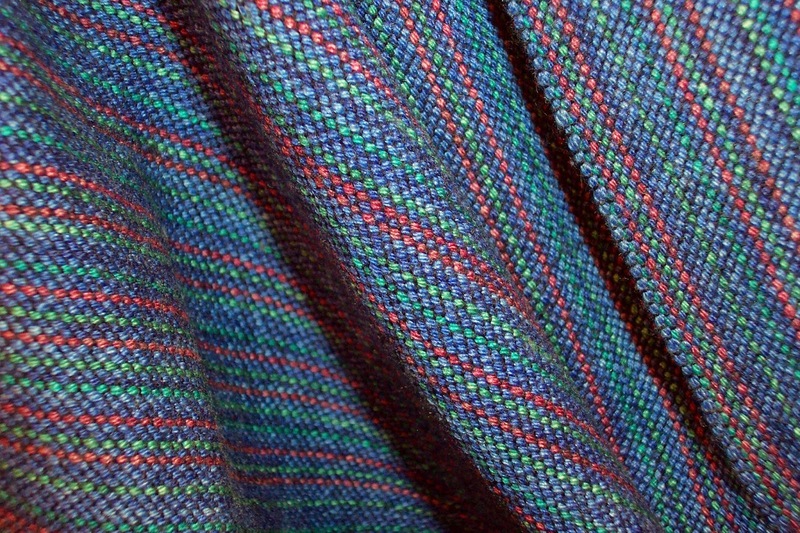 Topping the list are some special orders, which I'm really determined to get woven and delivered before surgery. I'm just waiting for a part for the AVL and the wide table topper warp can go on that loom. 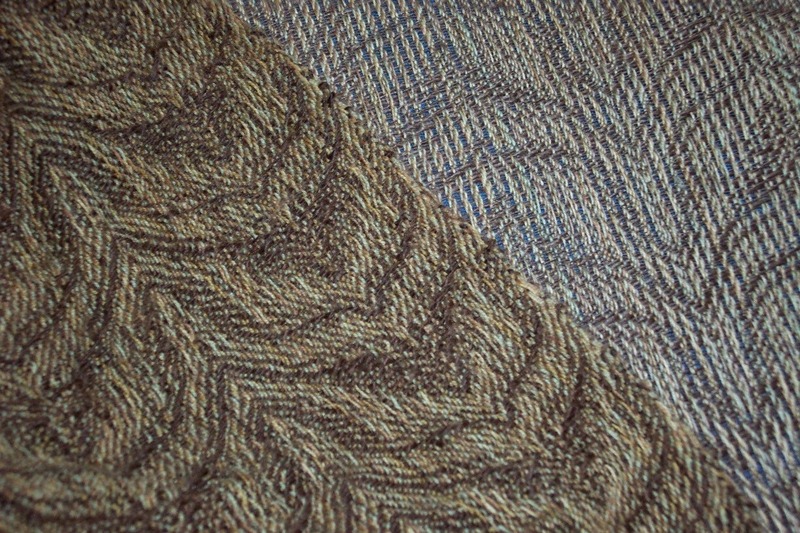 Once this scarf warp is done, I need to weave two special orders of place mats. And then I can begin inventory for the shows next year. I've already got the yarn for a run of shawls picked out and a tentative draft. So much yarn, so many ideas, so little time. I seem to be well into the season, given my colour choices! 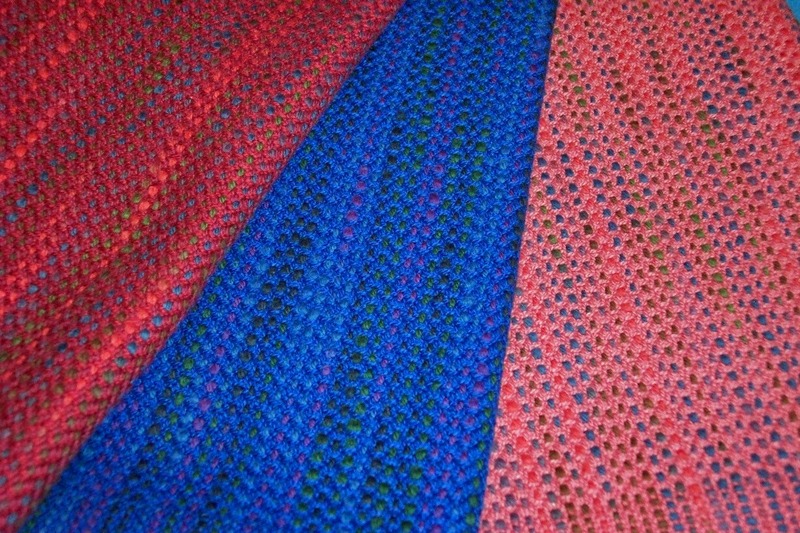 The above picture is #2 scarf on the current painted warp. Two more and this warp will be done. 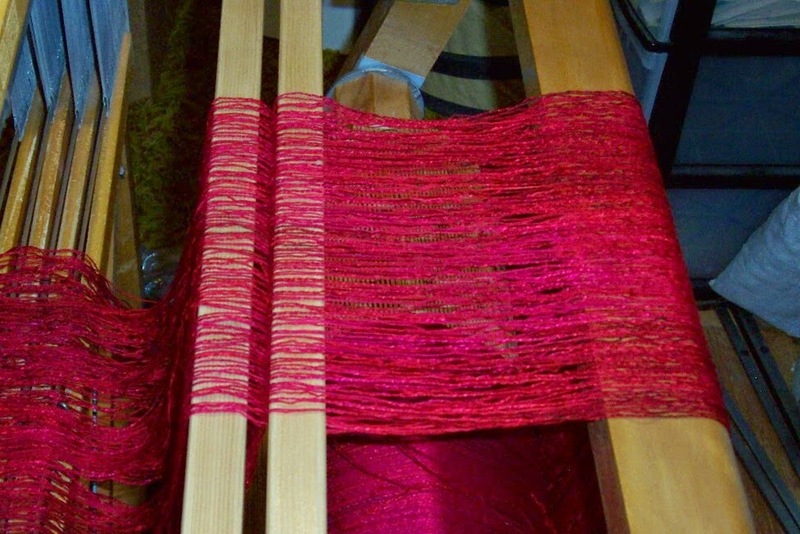 And then one more red warp and I can finally cross "weave painted scarf warps" off my task list. It seems like forever. And way to go Canada Post. I only placed the yarn order last week and the box is already here. 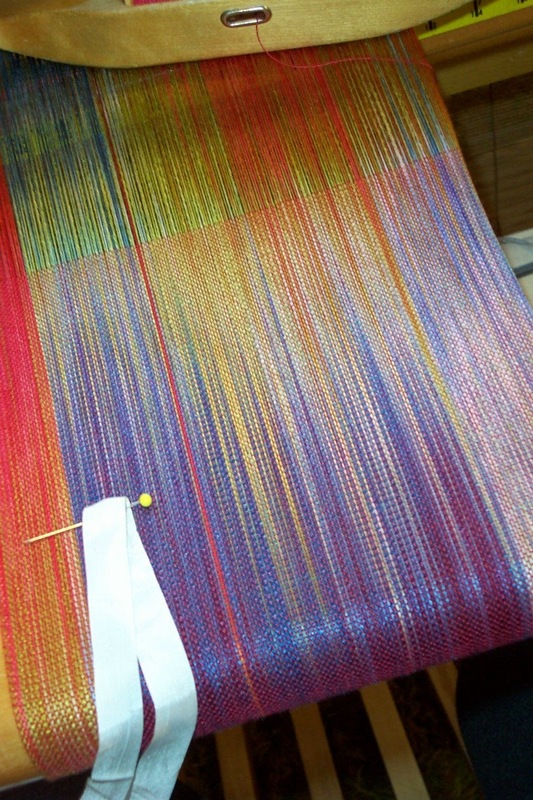 This warp is going onto the AVL because it needs to be wider than will fit on the Leclerc (41" in the reed). While I had a rough idea of what I wanted to do - enough to go ahead and order the yarn - the fine details still need to be worked out. While I wove on the scarf I ran through a bunch of possibilities and now need to sit down and crunch numbers. Over the past few days I've been going over my check list for the surgery/recovery and today we decided to buy a LaZ-Boy recliner. It reclines and lifts, heats and massages. Now I need to get rid of my sofa and re-arrange the furniture to fit the recliner into my tiny living room. 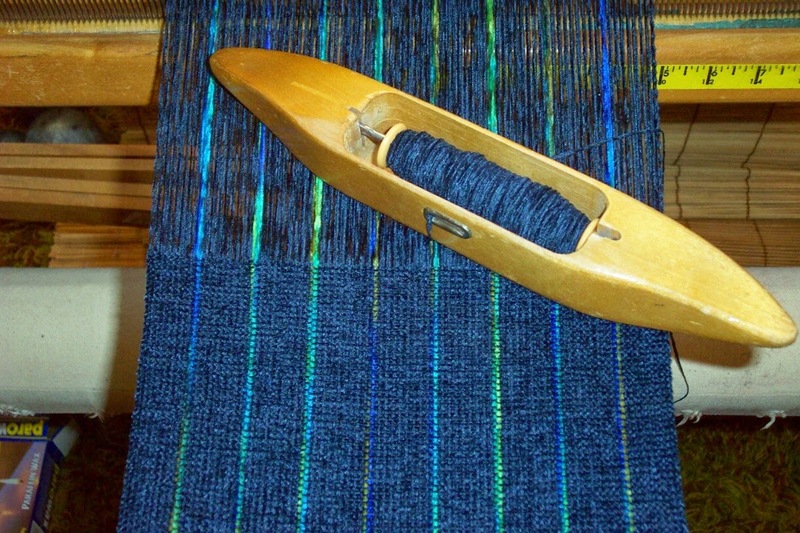 Endings in weaving aren't really endings at all. 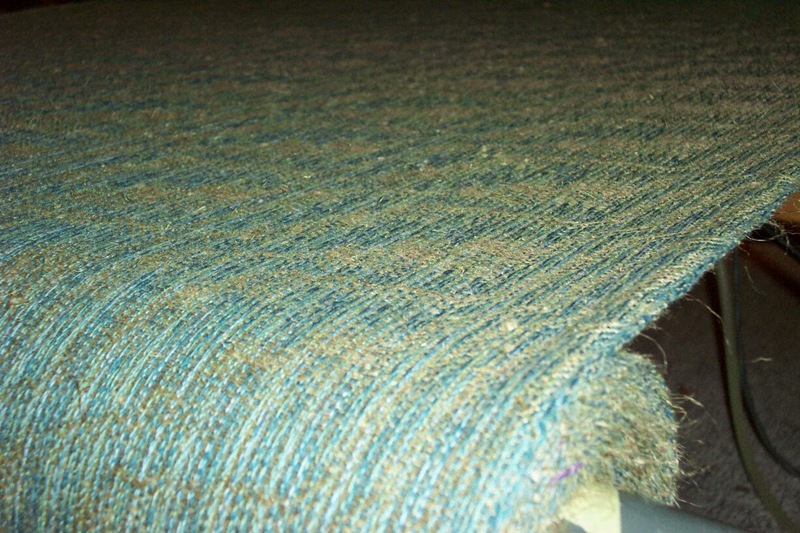 Yes, I cut this warp off the loom today so that could be considered 'ended'. But it's not close to 'done' yet. 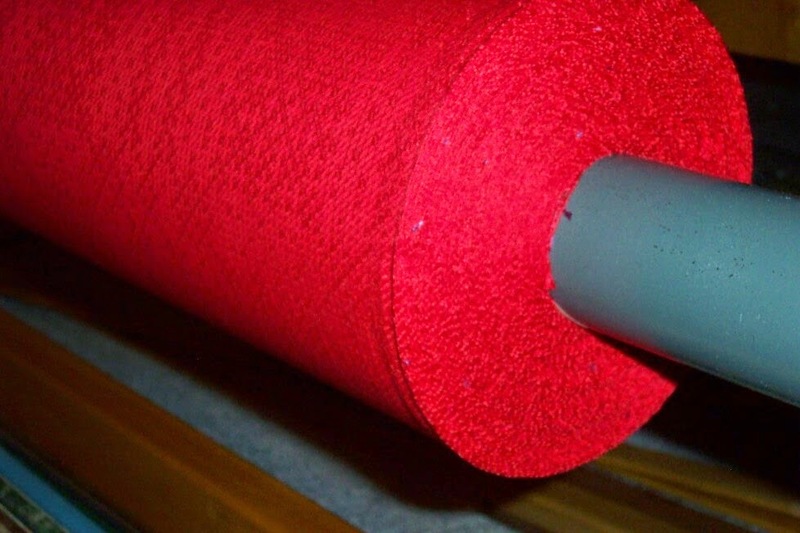 The cloth roll is being cut and serged in preparation for wet finishing. After pressing, they still need to be hemmed, pressed again and then tagged/priced. Only then will this particular cloth be truly 'done'. But even then, the job isn't really finished. They still have to be sold or gifted to a new home. When your stated goal is to make things to sell, until they are sold you really aren't finished with them. So as much as I find standing in my booth at a craft fair being pleasant to people uncomfortable, until it's sold, the job isn't finished. As one exhibitor put it, if it isn't sold, it might as well have stayed raw materials on the shelf. Now that is, perhaps, an over simplification, but if the whole point of making something is to sell it, then you have to do what needs to be done in order to get it sold. Making stuff to sell isn't the only reason I make stuff. I make stuff because I have to. I have a creative urge that will not be denied. If I wasn't making, I would be pretty awful to be around. The difference between me and most other weavers (not all) is that my intention is to sell my textiles, and was from the very beginning. 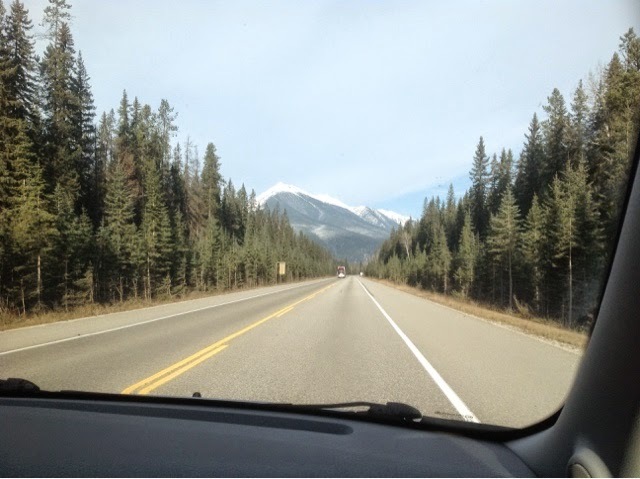 This isn't something that everyone can do - financially it's a pretty hard road to travel. Many people find that having a secure job with a regular paycheque and benefits allows them to be creative in their off work hours. Not everyone can gamble on being able to make and sell things and still be able to eat and keep a roof over their heads. Others wait until they've put their 25+ years in and can collect their pensions before they start creating and maybe selling a little. I've always said that weaving can be a good supplemental income but a really hard 'living'. But whatever level someone participates in making really doesn't matter. What matters is that we find a life that gives us satisfaction. Regardless of what you do, every single 'job' will have it's benefits and...frustrations. For many years my new year has begun in December. December, when all the shows are done. December, when I could collapse for a few days. December, when pressing deadlines were pretty much nonexistent. December, when the shrinking hours of daylight turned around the solstice and began to lengthen once again. December, when the promise of returning light, spring and life brings hope. It is the human condition to be faced with challenges. Without hope these challenges can seem daunting. Indeed they may seem insurmountable. The only way out is through. Our ancestors celebrated the returning sun with light. Huge bonfires were built to drive away the dark and encourage the sun to return. Today we string lights, draping them over our houses, trees, fences. We erect trees inside our houses, similarly draped with light. We look forward to the new year, the coming spring, the return of life. Beginning today the daylight hours will increase. I, for one, am celebrating the new year today. Wishing everyone the very best for the coming year whenever and however you celebrate. One of the things that attracted me to weaving was the intellectual pursuit of questioning "What would happen if...?" Over the years I enjoyed digging into this or that aspect of weaving, learning as much as I could about changing various factors and what effect those variables had on the cloth. But for the last 10 or so years I simply haven't had the mental acuity to delve into cloth construction in any depth. I nearly launched a research project in 2010, then broke my ankle in two places. Since then weaving has become mostly a "let's use up as much stash as possible while weaving becomes therapy" kind of activity. Last spring, after the DVDs were taped I started thinking again about a more intellectual pursuit of weaving and joined Complex Weavers, thinking to join a study group. 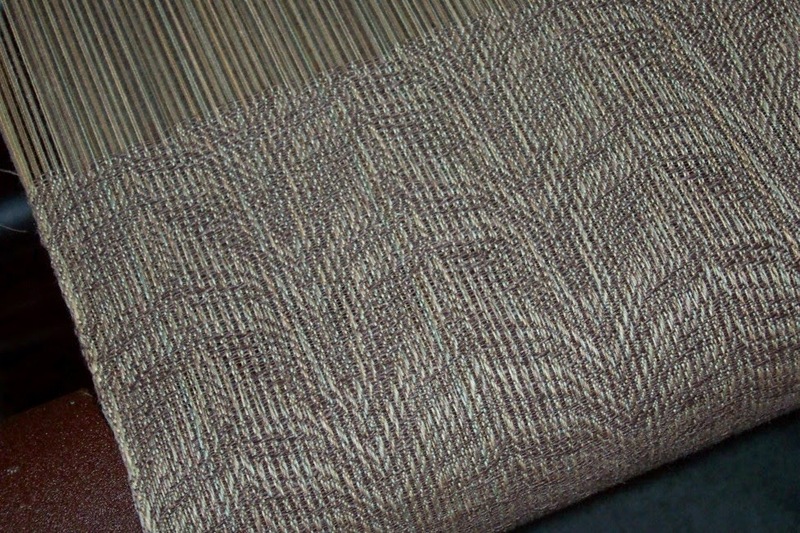 I did get the sample I agreed to woven but then life got...complicated...with more health issues. Now that surgery is nearly here, hopefully just a few more weeks to wait, I had been commenting to a friend that I would like to pursue the 2010 project, but the special yarn required was no longer commercially available. While I could spin it myself I'm not a proficient spinner and I'm definitely not fast. Turns out she was just as interested in the topic as I am. And so I have a partner willing to leap into doing some research. And now I'm anxious to get the surgery over and done with! As we discuss what could be done, I suspect that leaping into the deep end might be akin to disappearing down a rabbit hole. Because when you change one thing, everything can change. And that is part of what I have always found exciting about weaving. Currently reading Bones Never Lie by Kathy Reichs. There are some aspects to weaving that are more...challenging...than others. People can approach weaving any way they like. 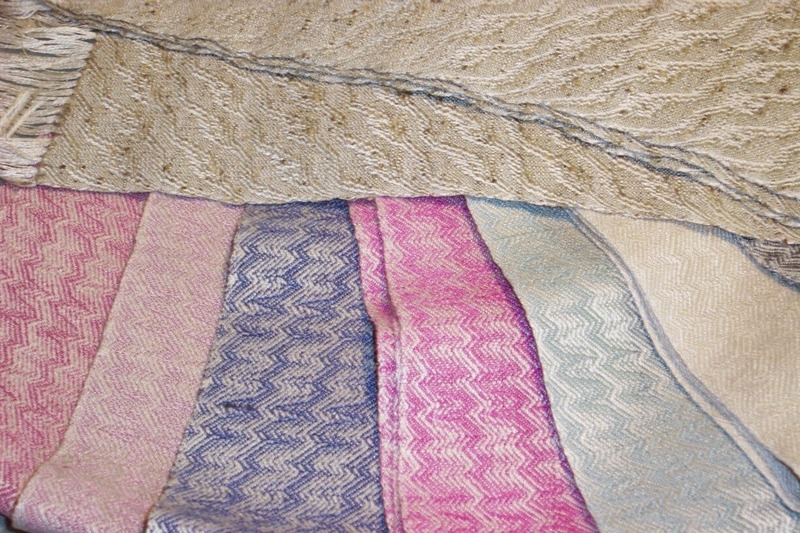 Some people find the combination of warp and weft colours, texture, or the more 'technical' approach more intriguing. Some people like all of those, all together or serially. 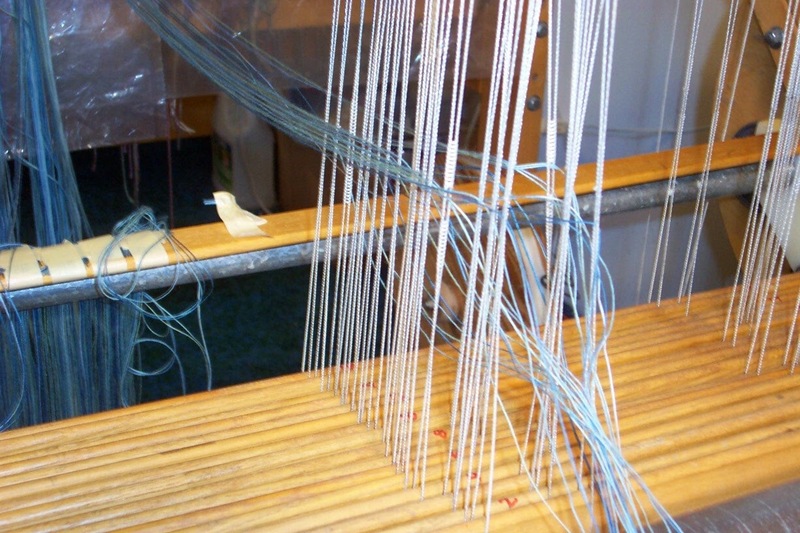 A weaver can focus on honing their technical skills, or they can just go with the flow. As long as the individual is happy, it doesn't really matter. 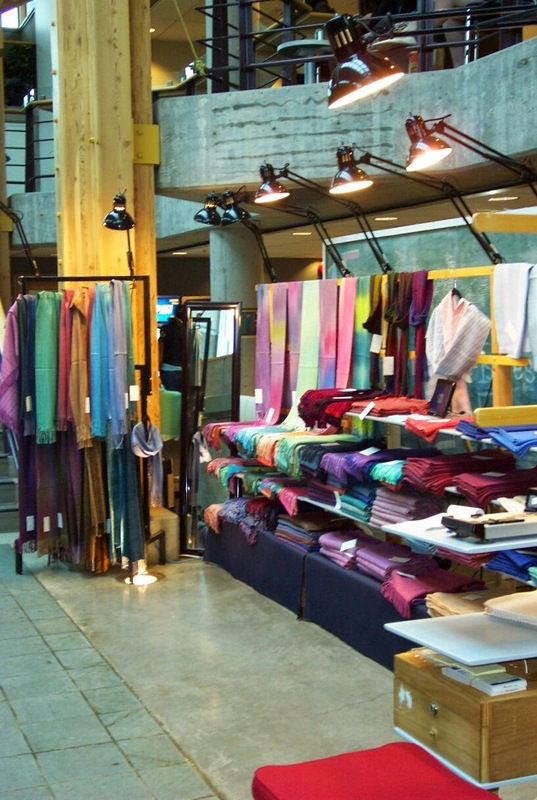 However, if a weaver is going to enter a juried show or in some way put their work into the world to be judged, they really need to be aware of what they are doing and how they are doing it. I have juried exhibits on a number of occasions and while how I mark is a reflection of my opinion, it is an informed opinion. I have gone through the process of being judged and while it's not always pleasant to have someone point out faults, it is always educational - if we accept that perhaps the judge/jury may know more than we do and then see if their comments are applicable. One time I agreed with another juror that a particular textile we were examining did not deserve first place. When the third juror questioned why we would not give first place to that item, I pointed out a rather (to me) glaring technical fault with it. In the end we all agreed that while it was a pretty impressive piece of weaving, it could not be given a first place ribbon. So what's the story with the above photo? And is it 'perfect'? Well, first of all, no, it's not 'perfect'. The weft used is actually a little bit too thick and the pick count is 'off'. So I would never submit this textile to a juried exhibit. 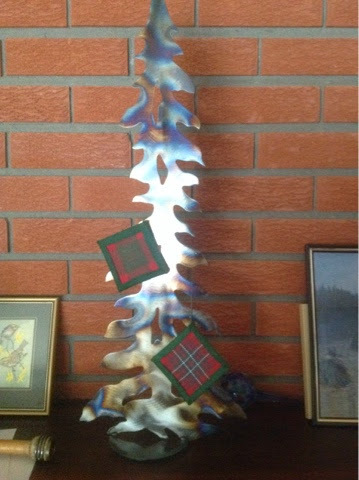 But it was never intended to be on display for anyone but my family and friends. 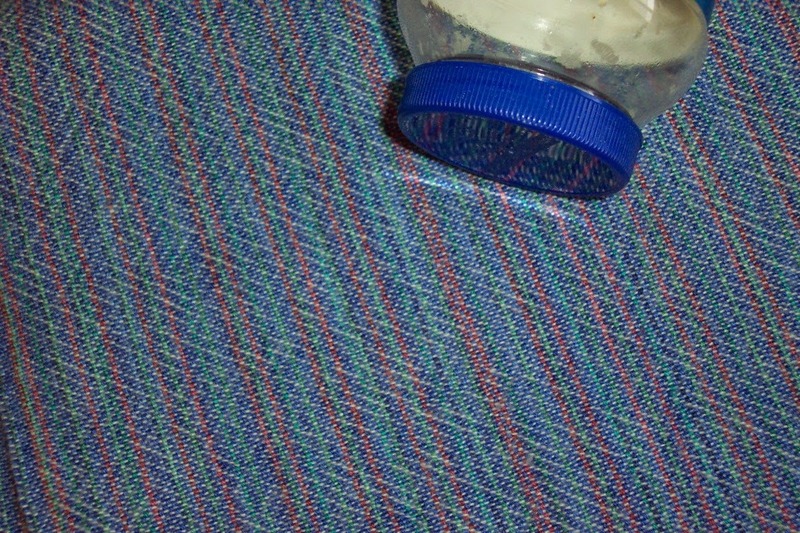 It lives on my dining room table, covered with clear plastic so that it can be seen but doesn't get dirty. The whole project came about because my Swedish neighbour desperately wanted this particular design which is traditional to the province she hails from, but wide enough to properly cover her large dining table. She also wanted three cloths, one for each additional leaf to extend the table for small, medium and large family gatherings. And she wanted each cloth to have a 'proper' border all around the edge. In order to get the width required the cloth had to be woven double wide. Whew! I decided to take a sabbatical from production weaving at one point and told her I would do the table cloths for her. 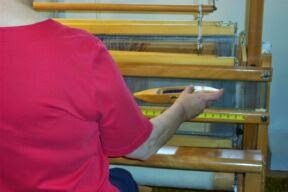 The warp was wound at 36 epi per layer (72 epi in total) 30 yards long, just in case I messed up one or more of her cloths. Once I got the loom dressed and started weaving it became apparent that every single shed had to be checked and cleared. I used a small hand mirror to check from each side to make sure the shed was clear before throwing the shuttle. Out of the four sheds for each two picks, only one was clear some of the time - the other three always had to have some threads re-aligned to make a clear path for the shuttle. And the fold. 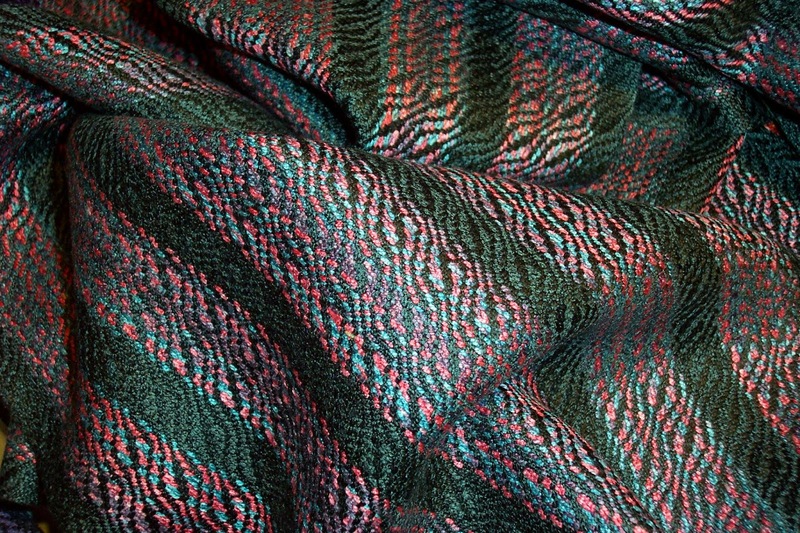 Oh, the fold, the bugabear of weavers who try to weave a double wide fabric! After managing to successfully weave her three table cloths (she got to hem them!) I still had some warp left over. 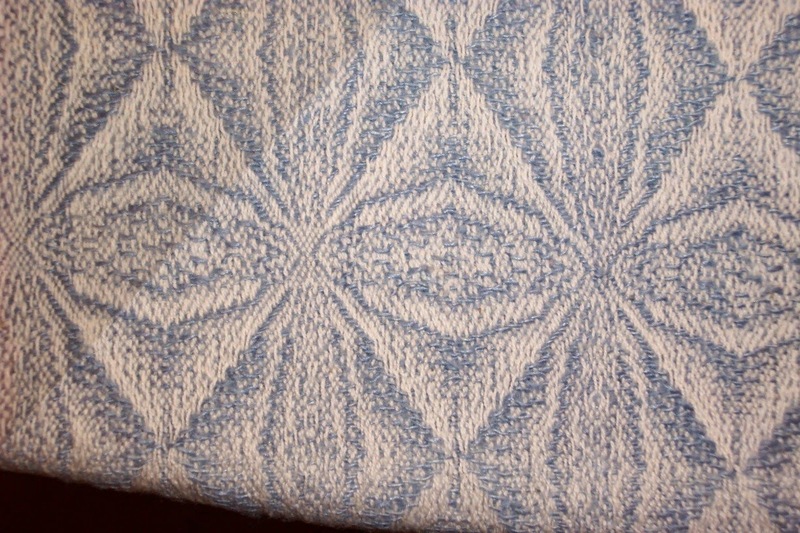 I also had enough of the singles blue linen to weave myself a cloth to fit my table, plus one for a friend. The 30 yards took about 3 months to weave as I could only manage 9 inches a day instead of my more usual 10-15 yards a day. It was an huge technical challenge. By the end of it I felt enormous satisfaction. There wasn't a single pick that wound up in the 'wrong' place - not one area where the two layers were 'stitched' together. The cloths fit my neighbour's table 'properly' and she was thrilled. I have a piece to display on my table and I gave a gift to a friend who had been very generous to me. But it was a once in a lifetime project. Been there, done that, got the tablecloth! This photo is a little out of focus but with my future a tad 'blurry' at the moment...at least the colours are pretty accurate and you can see the nice thick roll of cloth building up on the beam. So, all in all, the photo seemed appropriate for where my life is at the minute. A friend asked me if the waiting wasn't really hard. I said that it wasn't, now that I had some sort of semi-accurate timeline. Not knowing when it might happen was much harder. Knowing that it is coming soon allows me to get mentally prepared as well as working out some of the logistics. Another friend always says that it is better to have done something than that you will be doing something - especially something that has a certain level of...unpleasantness about it. At this point in time I've reached the stage where I'd just like to get it over and done with. I survived the broken ankle. I survived the chemo. I will survive this. And ultimately, the quality of life after recovery should be better than it is now. So for the time being I am using weaving as therapy. My chances for a speedy recovery will be better if I can maintain some level of physical and mental fitness. If I can continue to weave, even if it is just 'easy' stuff, I should be able to retain some physical fitness and the endorphins from the aerobic activity, mild as it may be, will help me mentally as I face at least 6 weeks after surgery before I can weave again. And even then, I expect it will have to be on the Leclerc, weaving something that doesn't require a whomp of the beater. To that end, I've planned to leave the Leclerc with a shawl warp that requires a very gentle open spacing of the weft, not a place mat warp or even a scarf warp. I have purchased clothing that buttons down the front (won't be able to raise my hands over my head for a while), decided that Doug will stay at the hotel next door to the hospital so that he can bring me 'safe' meals (I don't trust the hospital to be able to cater to my very specialized allergy restrictions) and that we will fly home. I have stocked up on books, puzzles and may possibly have hand hemming to do if I get a bunch of place mats woven. The hospital will phone to let me know the anticipated date about two weeks before they think they can fit me in. At that time we will hope the hotel has a kitchenette available for 10 days, which, being January, they ought to. There will be things to deal with before we go - two weeks should be ample time to arrange them - house sitter, mail collector, driveway shoveler (probably all the same person), bills to pay, suitcases to pack. I can't help but think of the line from Best Exotic Marigold Hotel - Everything will be all right in the end. If it's not all right, it is not yet the end. All of a sudden I feel as though I am being deluged by deadlines. 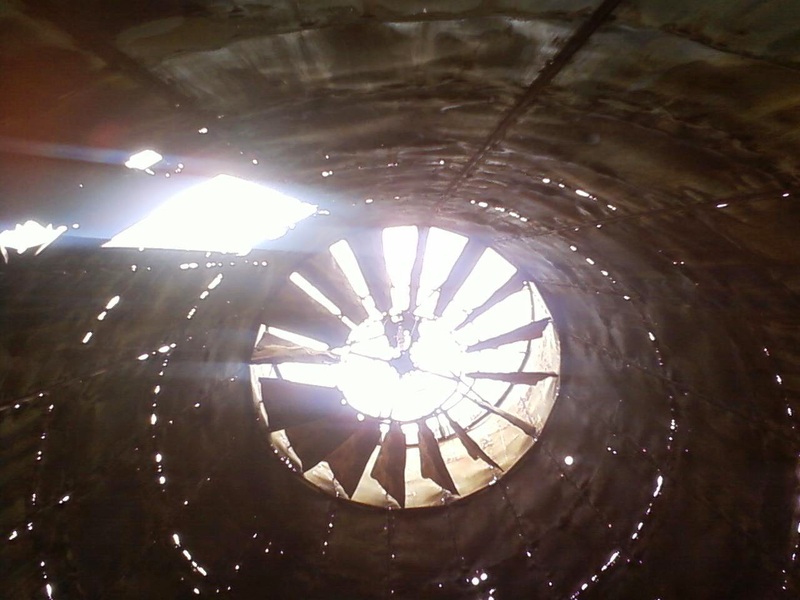 The proverbial tunnel with the light at the end? Feeling like an on-coming locomotive. As usual my request list at the library has entered into the 'feast' phase - after weeks of waiting for a number of new titles from my fav authors, suddenly they are arriving. We won't discuss the number of books I own and therefore have no due date. Each day I arise, determined to jump on the daily tasks and each day I move about as quickly as a sloth. My energy seems to arrive around noon and disappear by 4 pm. If I don't get into the studio during those hours I get nothing done down there. Or anywhere else. Add to that other tasks awaiting me and it feels like I am accomplishing very little at all with several things about to go critical in the next few days. And yet, here I sit at the computer, ignoring what really needs to be done. Back to my usual coping strategy I guess. Make a list. Start crossing them off, one at a time. ....and here I go again. 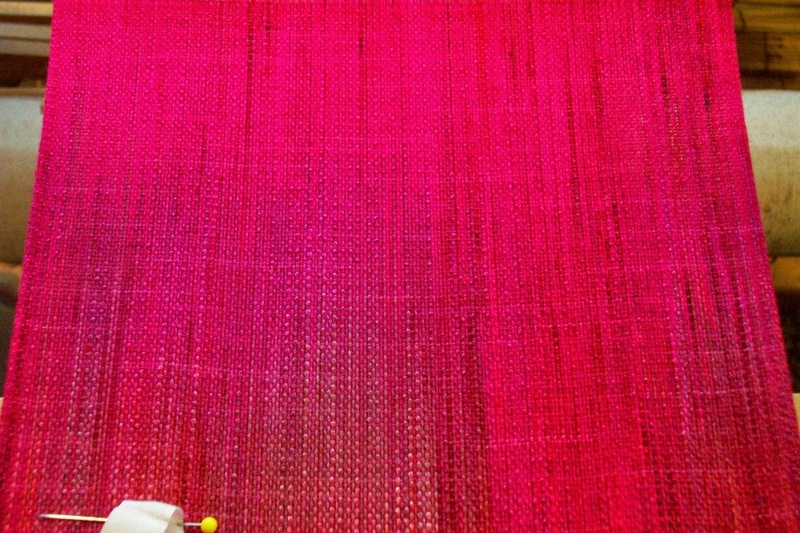 The first few ends in a warp that will be 764 ends. You might just be able to see that it's mostly blue with a little 'sea green'. 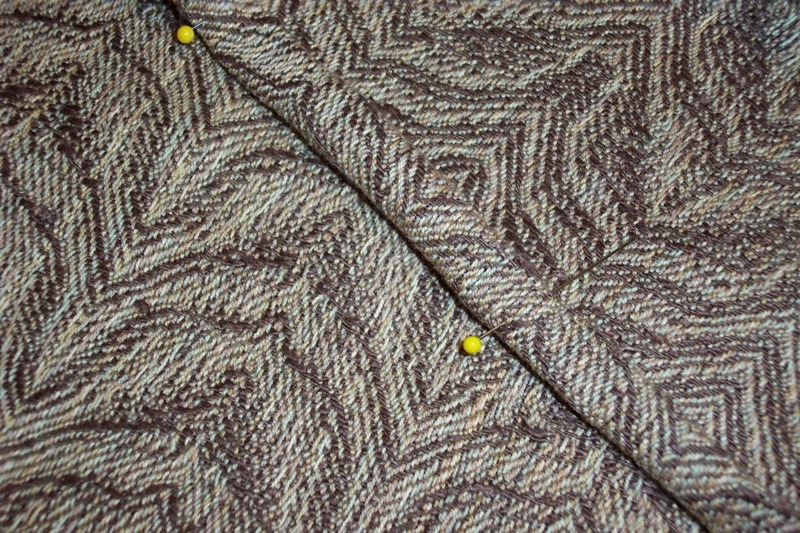 The threading is another variation on point twill that will likely be woven in an advancing progression. It's not quite what I had envisioned, so I may play with the treadling and tie up some more once the loom is up and running and I can see how it actually looks in the cloth rather than on the computer screen. In the flesh, so to speak. 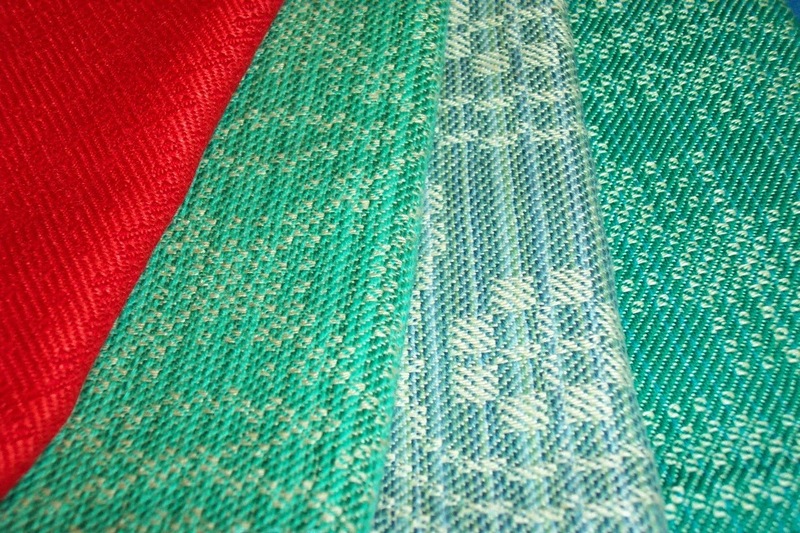 Yes I do use weaving software - Fiberworks by choice. I have played around some with Pixeloom which in many ways is similar but I know Fiberworks so very well I have never felt like wallowing at the bottom of the learning curve to learn a new program. What I've seen and done looks great, though, so if you are in the market for weaving software, either of these programs is pretty intuitive for most people to use. If you want to know way more about Fiberworks than I do, Margaret Coe has pretty much written the books you need. For the iPad I use iWeaveit. I began this threading by messing about on the iPad, then when I had a threading I thought I liked, emailed it to myself so I could open it on the desktop in Fiberworks. From there I derived a tie up (my standard 1:3:1:3:2:2:3:1) and played with woven as drawn in, advancing, variations on advancing. When I knew I could do something close to what I wanted, I generated the threading only to follow as I thread. I keep a pencil or pen handy and as I do each handful, mark off where I am in the sequence. When dealing with a very long repeat (5 repeats in this warp plus borders) it's all too easy to get 'lost' if the phone rings or something causes my concentration to fail. Something that happens more and more often these days. And something that I hope will improve after the surgery. Or not. I am 64.5 years old now. I've been told memory gets a little funky as we age! The small loom is still nekkid so perhaps I'll get that dressed too. I would sure like to finish off those last two painted warps so I can cross that task off my job list. After 30 yards of beige, especially during the dreary grey days we had been having, I really needed a palette change. Since the AVL was nekkid and the Leclerc still had the last half of a painted warp in RED, it was a delight to switch over to that loom. Not only that, but to finish one more warp was very satisfying! 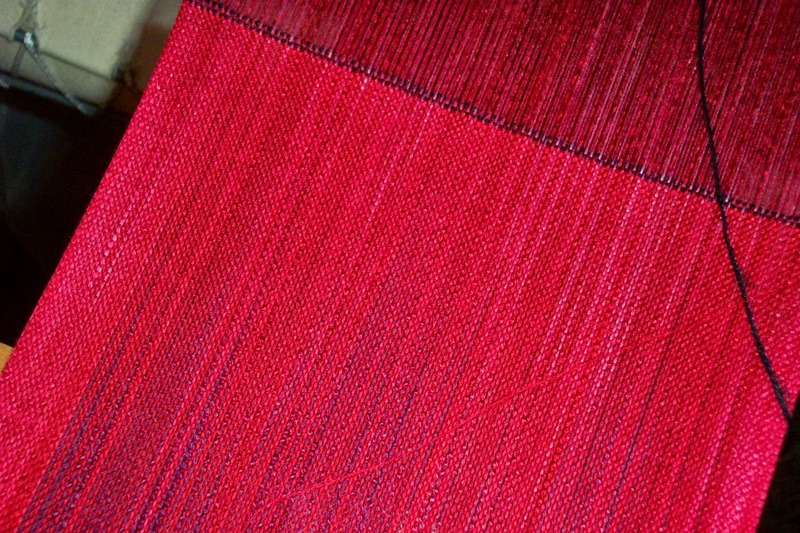 There are two more red painted warps left, which I will continue to work on in between working on the AVL. Now that I have an approximate surgical date we are beginning to make plans for the coming year. Ultimately it is looking increasingly as though I am 'retired' from teaching in the US - the difficulty of getting across the border is just getting to be too much of a hassle - but I hope I can continue to teach in Canada - either here in Prince George taking private students, but most especially in BC and Alberta. 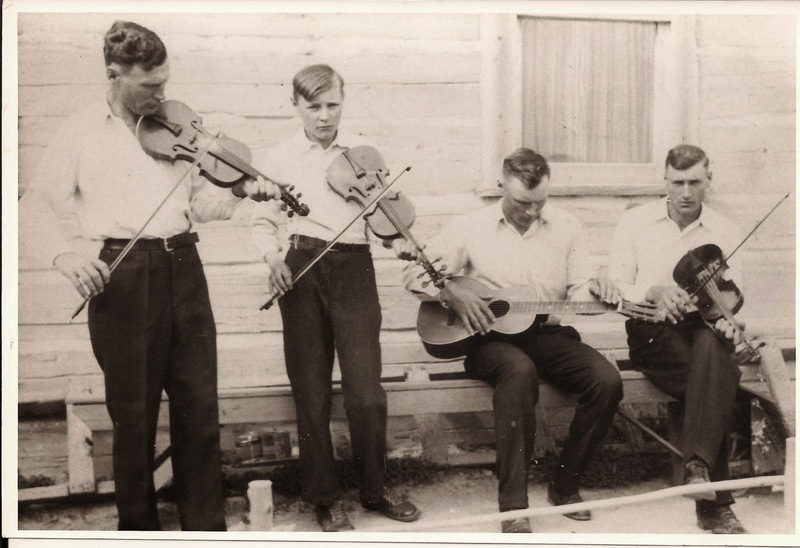 Right now we are looking at possibly being at the provincial conference in Red Deer next May, and Olds Fibre Week in June. The ANWG conference will be held in Victoria in '17 so I'm hoping to be healthy enough to apply to teach there. But essentially I have a couple of pretty large 'swords' hanging over my head in terms of health issues as well as the little ones most people have at my age. So I'm not making big plans about much of anything right now. Mostly I'm focusing on getting through next Jan/Feb and then see how things are going. Stash reduction will continue to be a priority as I fill up the 'holes' in my inventory from a fairly successful craft fair season. Such a nice 'problem' to have! Even better that enough things have sold out that I get to design whole new lines of things. I can hardly wait for my energy to come back! This past weekend was the guild sale/demo. Unfortunately it was rather more quiet than hoped, but a few of my 'discontinued' items found new homes so that made me happy. On Sunday Doug went pressing and brought home the finished, finished, red tea towels plus a bucket full of the chocolate brown weft towels. I am quite pleased with how they look but they are thicker than my preference for 'tea' towels. They would make good 'kitchen utility towels'. Or table runners. 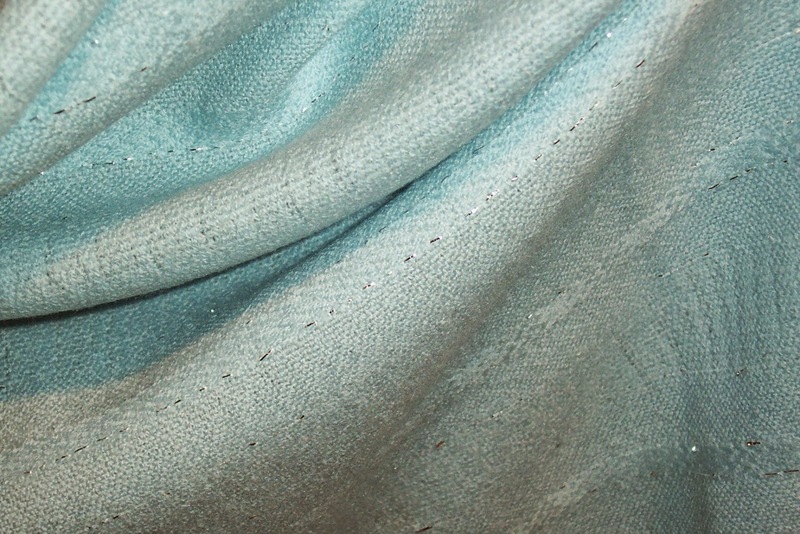 In this photo you can see both sides of the cloth and the pinned hem at one end. I started hemming last night, but didn't get very far. However, these are close enough to done with one week left in my 'buy two items, get free shipping' offer to include them. There are about 15 of them. After a couple of weeks of lovely winter weather we are having a warm spell. The bad news is that with the warmer temps comes rain. It isn't raining yet, so I should really head to town and brave the line up at the post office. The down side of running a 'sale' at this time of the year - everyone else is mailing Christmas parcels and the line ups are huge. The colour is so dramatically different because the towel on the left is wet while the one on the right is dry. IOW, before and after wet finishing (although the wet one still needs to be pressed). Even so, you can easily see how much the wet finishing changes the cloth (click on photo to biggify). Although I know the colour will go back to its dry state, the reed marks are much less pronounced and to me it looks like whole cloth, not a set of interlaced 3 dimensional 'rods' (threads). Believe me, cutting and serging this warp was a challenge because it tended to fall apart if you looked at it cross ways! The brown linen is not tow but probably line linen, therefore very stiff and all too inclined to pop out of the woven web. Serging at least prevented the part I wanted to keep contained, but the bit that was being cut off? A mind of its own, to be sure! I had to keep stopping to tame the wild loose threads, use the tweezers to remove them from the guts of the machine and from hitching themselves onto the part that was being sewn. Even so, the serger thread broke twice because of those loose threads tangling. So I was very happy indeed to finish cutting and serging, knowing that that yarn is all used up! Stash reduction! Gotta love it. ps - since these towels are now off the loom and in the process of being wet finished, they qualify for the 'buy two, get free shipping' offer that continues until Dec. 15 - or inventory is sold. 14 towels with the chocolate, 5 with the natural beige tow linen. Currently reading Enemy in the House by Lindsey Davis. My AVL is an 'antique'. Yes, that's right, it's number 00181. 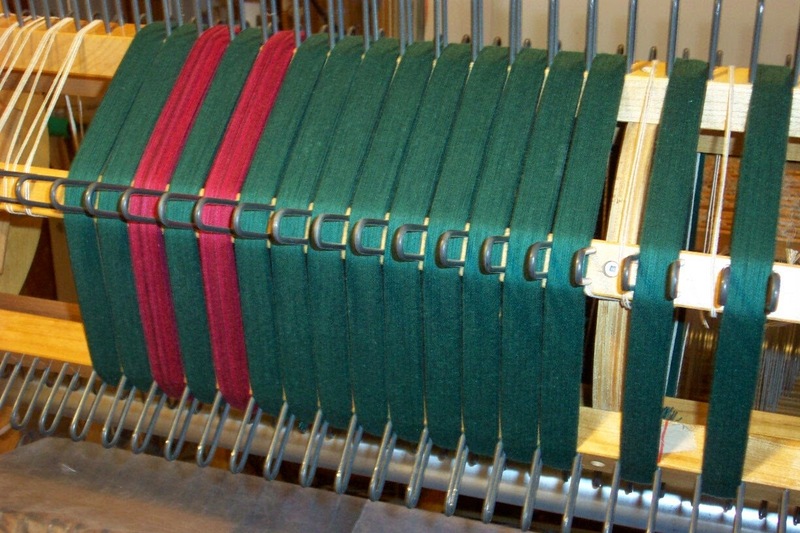 It was probably the first loom shipped with a fly shuttle and the auto-cloth advance arrived about six months later. This was in, oh, 1982. So the loom is 'antique' at 32 years old. That's 32 years of production weaving, with literally miles and miles and miles of cloth over the beams. As the weaver using it has aged, so has the loom. Bits and pieces of it are wearing out. And so it happened today that when I changed the pick wheel from 26 to 28, all of a sudden the auto-cloth advance would not work any longer. Unfortunately the hole that the bottom lever sits in is worn. Badly. So badly the lever would not align properly and was preventing the mechanism from working to advance the cloth. 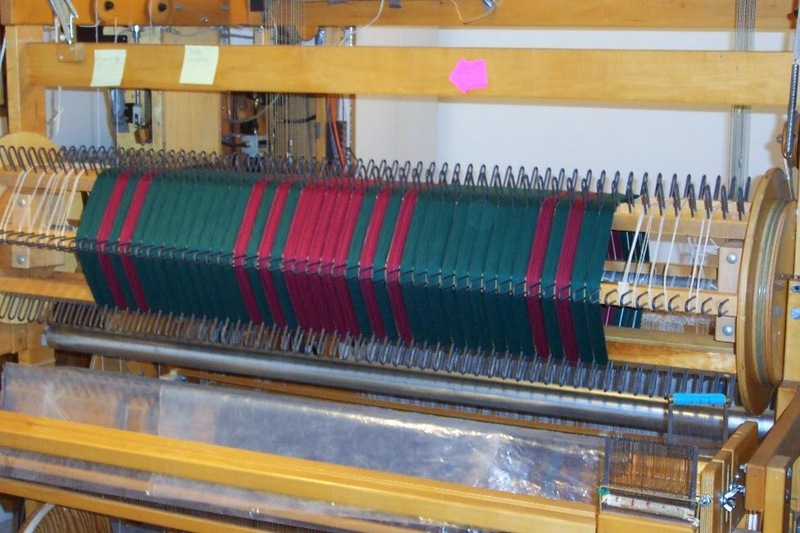 Doug was able to jury-rig a fix which I hope will see me through the last 5 yards of warp on the loom and then he will do a better fix which will hopefully allow the loom to continue to work as it is supposed to do. While he is doing that I will hop on over to the Leclerc and finally deal with those painted warps for scarves. Hopefully it won't take long to re-drill the hole and insert a bushing, but I'm not sure he can do it himself or if he'll have to find a metal worker/machinist. I'm hoping that he can get it fixed so that it lasts the rest of my weaving life. I rather suspect that when I'm done weaving, this loom will be, too. Since I still have inventory that I would love see go to a new loving home, and since it would be nice to join in the spirit by having a sale, I am reprising my 'buy two (or more) and get free shipping' sale that I did over the summer. 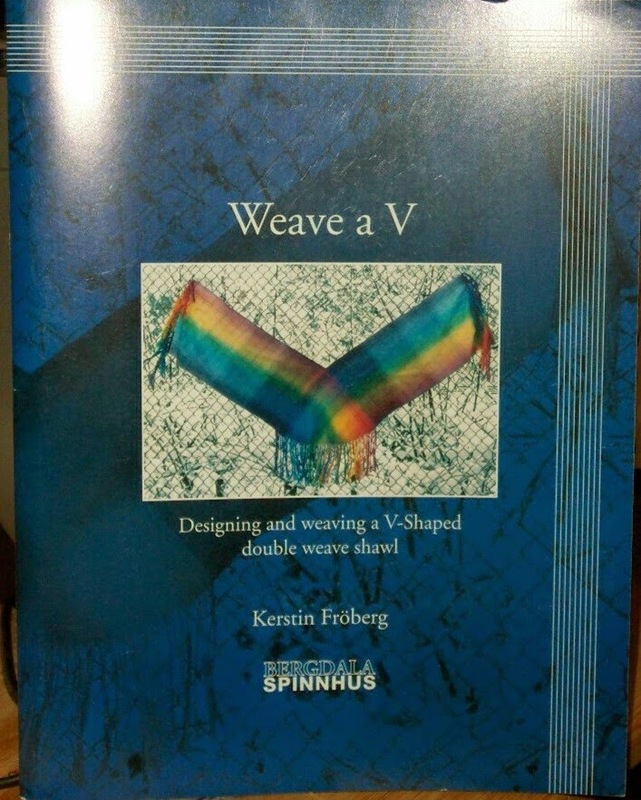 Weave a V by Kerstin Fro;berg - $20. My version of Cyber Monday will last until Dec. 15 or until stock is sold. Items shipped closer to Christmas might arrive after the Christmas mail rush because I will only pay for the cheapest rate. And yes, this includes outside North America. I also have a few 'orphans' - if you don't see a colour you want, I may have one or two left and will send pictures if you let me know what you are looking for. Season's Greetings to everyone - whatever you celebrate I hope it's a fantastic one. There are no purple shawls left, just this one blue shawl. On my monitor the colour is pretty accurate. Doug suggested using something to compare colour with so the blue lid is from a Kraft Miracle Whip jar, which also looks pretty accurate on my monitor. 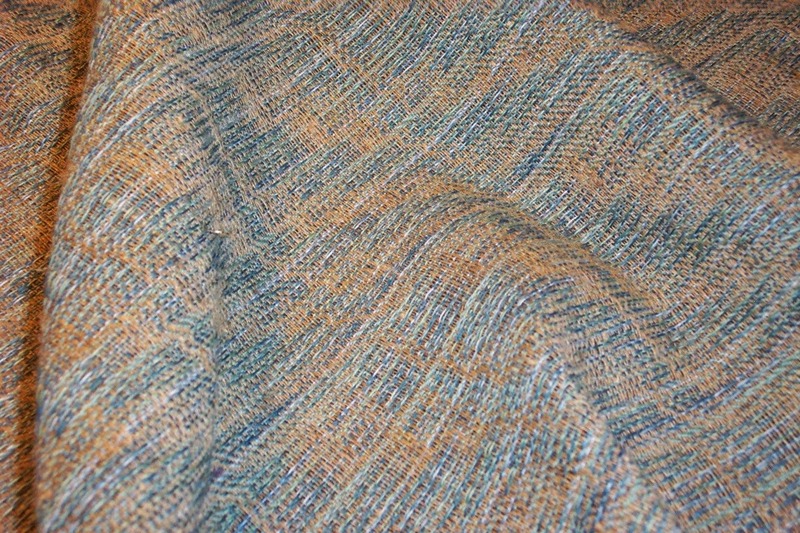 This shawl is probably too blue but it's all I have left other than the pink/white ones. Another weekend, another fair. 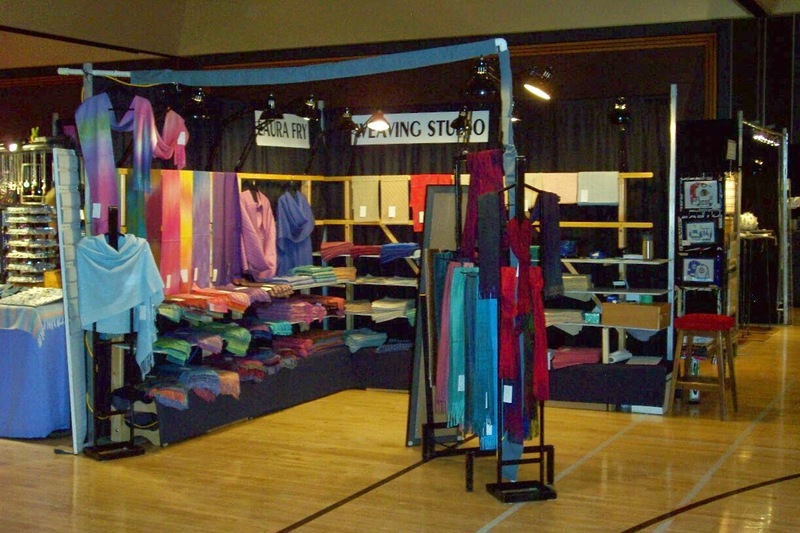 Over all look at my booth. I have way too much inventory - hope people will fall in love with some of it and give it new homes. These are some of a run of silk scarves I did a few years ago. I was down to two last weekend, and then one of the two sold so I only had one left - the purple one more or less in the centre. Now after being in business for as many years as I have, eventually you wind up with stale inventory or 'last one of a series'. These items have been dragged to numerous shows (in case of the former) or else are difficult to display because they are just one. They don't 'fit' into the display well. But mostly it is because I want to help support an organization that I know is probably struggling to make ends meet and this is the only way I can do it. So that purple and white silk scarf got dropped off the the Early Childhood Development facility this afternoon for their fund raising auction. I have a tenuous connection to the facility - the lady who lived next door to us when I was growing up worked long and hard to establish this support agency for children with disabilities, mainly because her son with cerebral palsy needed something like this and it didn't exist at the time. She wanted other parents to not have to struggle so hard to get their children the help they needed. She doesn't live in this town any more, but her legacy lives on. And I like to help keep it alive. One thing about being self-employed is that you have to be self-motivated. I find one way to do that is to have very clear goals and a time frame in which I want to achieve them. So deadlines are my friend. Even though they are self-imposed, they help to get me up in the morning, dressed and to the studio to work on the next step(s) in helping me arrive where I want to be. Unfortunately Life sometimes has other plans. And so the lovely red warps above are still just that - warps. We are already into the show season and anything not woven by now has missed this particular boat. That ship has sailed. Not being able to weave for almost 6 weeks this summer means that I could not get everything woven that I had on my to-do list. No blue place mats. No red scarves. Well, only one warp of red, anyway. Bottom line? I have depth of stock, if not breadth of stock. The van is full of textiles and hopefully enough people will find something they like and buy. As for the rest? It will get done for next year's show season. I hope. Making plans. Setting goals. Making deadlines. We'll see if Life co-operates. For the first time the University allowed us to unload and bring everything in the night before the show. It made things so much easier! We didn't set out any product but got the booth up, the lights installed and all that needed to be done this morning was set out the product. Since we didn't have to get up at 5 am, the day is much shorter! This is a smaller show - only two days - but a very nice venue. Although the Winter Garden has sky lights and normally gets a good natural light, today was very overcast and dreary. And then it started sleeting in the afternoon. It didn't feel as busy to me and several other craftspeople commented that they felt there were fewer attendees as well. In the end my sales were 'ok'. Since this is a low cost show and local, sales can be less and still be ok. I was hoping to empty one box because there is one box more than will comfortably fit on the cart - but it doesn't look like that is going to happen.